This dish is one of my family's favorite. It is one of the dishes that all of us love - even my little daughter! My mom also loves this and always asks me to make it for her. And I make the without garlic version for her since she does not eat garlic. Onions, green chillies, ginger, garlic (optional), green bell peppers, tomatoes(lots), potatoes, carrots, green beans, cauliflower, peas. Also, have your hand blender ready - if you don't have one - you will need to use a masher but that becomes a good workout for your hands! Heat up the pan. Add the 1tsp of oil. When that's hot, add some jeera in there. Then add the green chillies, ginger and garlic - when done, add onions. Saute for a couple of mins - then add the green bell peppers and saute for another 2 mins. Then, add the tomatoes and cook for a couple of mins. 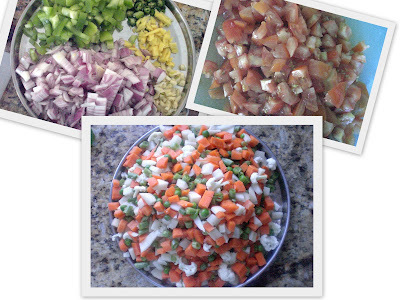 Once the tomatoes look done, add all the other chopped veggies. Now, add the salt and the pav bhaji masala. Mix it up well with all everything in the pan. 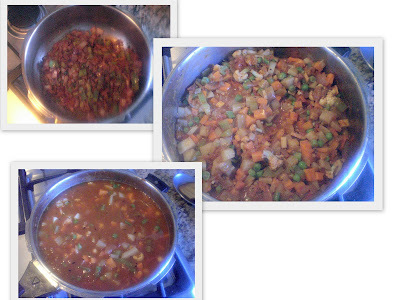 Add water to the pan till all the veggies are well immersed. Close the lid and pressure cook it till about 4-5 whistles. 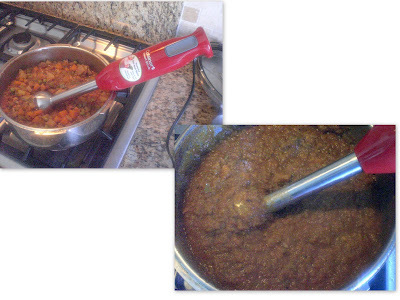 Once cooled down, open the pan - pick up your stick blender and blend the whole mixture for like 30 secs. Don't blend it too much and make it a paste - blend enough that most of it is crushed but you still have some pieces of the veggies in a biteable form. Taste for the salt and masala and add if needed. I don't add a ton of butter like how they do it in India - you don't really need that. Maybe add a spoon of ghee or butter at the end just for the flavoring. Add chopped cilantro on top. You can also add chopped raw onions on top for flavour. Heat up the pav with a little bit of butter and enjoy it hot with the bhaji! Delicious and healthy. There are about 10 veggies in there - much more than required daily - and its low fat - just a spoon of oil and maybe a spoon of butter if you add it. That's it! Enjoy the delicious pav bhaji and think about the good memories when you ate this road side in India!! That makes it taste even better! This is my all time favourite too. Looks yummy. It has been a long time since I prepared this. I do not use the blender. I just use the masher. Since they are pressure cooked, masher can handle the job well. Anyway, as always, your Pav Bhaji looks really delicious. Eggplant Panini - without the panini maker! Tukkada - Diamond Shaped Desi Chips! Paneer Kababs - Easy and Tasty!